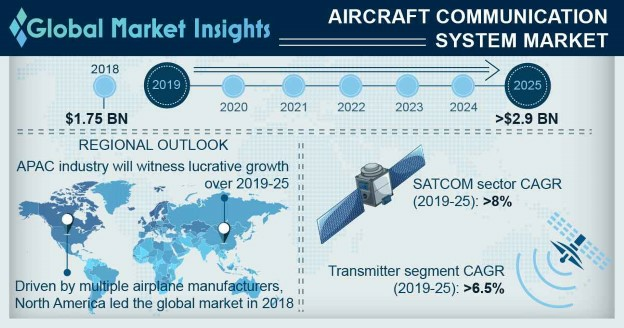 Aircraft Communication System Market size is estimated to exceed USD 2.9 billion by 2025; according to a new research report by Global Market Insights, Inc. Rapid globalization in conjunction with increasing air connectivity across new destinations will showcase potential opportunities for air travel over the forecast period. Moreover, expansion in the tourism and defense industry are the key factors expected to escalate air carrier demand over the study timeframe. Introduction of new aircrafts with a focus on reducing weight and incorporation of advanced avionics are boosting the aircraft communication system market size over the study timeframe. Increasing requirements for efficient transmission technologies enabling safer air travel across destinations are accelerating the aircraft communication system market growth over the coming years. Industry participants are continuously investing in R&D for developing innovative communication solutions further boosting the market share. For instance, in May 2016, NASA and FAA demonstrated innovative wireless technology that offers seamless transmission including sending route options and weather information. The Aircraft Access to System Wide Information Management (SWIM) enables efficient wireless operations with a taxiing speed of up to 70 miles per hour. These trends will positively influence aircraft communication system market size over the coming years. Proliferating military budget across the globe along with modernization of conventional air carrier fleet with advanced avionics are further accelerating the aircraft communication system market share over the study timeframe. For instance, in 2019, Polish Ministry of Defense announced the upgradation and modernization of its existing fleet of Mi-24 helicopters with the incorporation of advanced transmission, armament, navigation, and self-protection capabilities. Major regulatory bodies including International Civil Aviation Organization (ICAO) and FAA regulate aircraft communication systems marketplace to ensure fast and accurate exchange of information. Stringent regulations pertaining to air carrier safety has encouraged industry participants to invest more on development of signal transmission systems. Regulatory policies for replacement of outdated systems including IFR and VFR are positively influencing the market size over the projected timeframe. Based on product, high frequency will witness significant gains in the aircraft communication system marketplace. The superior transmission of signals for facilitating direct long-distance signal transmission along with improved transfer of data over shore areas are supporting the segment growth over the study timeframe. Increasing prominence of effective air traffic control (ATC) between airport control units ensuring air travel safety and reduced flight delays are supporting the market share over the projected timeframe. Antennas hold a substantial potential to capture the aircraft communication systems market. The requirement for constant transmission of signal from air carriers to ground air traffic control for maintaining the flight during the course of its journey are supporting the segment share over the study timeframe. Moreover, the availability of a multiple range of antennas with varied size and transmission capabilities based on the flight application further supports the aircraft communication system market share over the study timeframe. Commercial air carrier will witness prominent growth in the aircraft communication system marketplace. Proliferating air carrier production across the globe owing to rising air passenger traffic are boosting the segment growth over the study timeframe. For instance, in 2018, Airbus SE deliveries rose to 800 commercial aircrafts with an increase of 11% as compared to 2017. Growing adoption of low-cost carriers along with improving regional connectivity are escalating the industry size over the study timeframe. Europe aircraft communication system market share will witness robust growth owing to government initiatives on precautionary measures on accidents along with stringent regulations on air carrier inspection & safety. Increasing adoption of advanced technologies to enhance travel safety and avert air carrier accidents will propel the industry demand over the projected timeframe. Major players operating in the aircraft communication system market include L3 Technologies, Iridium Communications Inc., Harris Corporation, Honeywell Aerospace, Lockheed Martin, Northrop Grumman Corporation, Raytheon and Rockwell Collins, Inc. Industry participants are engaged in strategic acquisitions and mergers for expanding their market share. For instance, in 2015, Rockwell Collins acquired International Communications Group (ICG) for USD 50 million. This strategy was aimed at integrating the company’s satellite communication portfolio and diversify its business with a wide range of products.